The purpose of this letter is to respond on behalf of the Campaign for Clean Air in London to the consultation being carried out by Transport for London (TfL) on your behalf on a proposal to introduce Emissions Related Congestion Charging in 2008. (ii) engine efficiency (i.e. the “quality” of fuel burnt). However, CCAL considers that the current proposal should be expanded substantially and combined quickly with Dynamic Road Pricing (“tag and beacon” or its equivalent) to create a fairer and more ambitious scheme that will ensure that road transport makes its full contribution to the tackling of London’s serious air quality problem. CCAL urges Mayor Livingstone to create a behavioural “tipping point” with this scheme that could be sufficient to avoid the need otherwise for restrictive legislation. In the week when the European Commission has announced details of the legal steps it is taking against the United Kingdom (UK) for breaching its air quality obligations, CCAL has still not seen any evidence that reasonable efforts are being made by relevant UK authorities to introduce sufficient measures that together can be expected to result in the UK meeting its current or likely future legal obligations under European Union (EU) air quality legislation. It is no good any of us being “busy fools” – introducing measures that achieve little – a much more ambitious air quality plan with bold and decisive action is needed now. The Campaign for Clean Air in London has only one aim which is to achieve urgently at least World Health Organisation (WHO) recommended standards of air quality throughout London. Given that most of these have been required to be met since 1999 legislation by January 2005 (in respect of coarse particulate matter i.e. PM10) and January 2010 (for nitrogen dioxide i.e. NO2), CCAL is campaigning to achieve sustainably at least WHO recommended standards of air quality throughout London by no later than the London 2012 Summer Olympics. CCAL has received support from you, as Mayor of London, leading politicians from the four main political parties in London as well as leading business and community groups including the Central London Partnership, London First and The Knightsbridge Business Group. We have also received a Pledge of support from Environment Protection UK (formerly the National Society for Clean Air and Environmental Protection). Our campaign website address is shown in the letterhead above. CCAL fully supports effective “polluter pays” charging schemes and seeks that they should be ambitious, effective and well thought through and combined, for the worst polluters, with banning. With road transport causing between 50% and 75% of air pollution in London’s busiest roads, London needs: (i) emissions related charging for vehicles; (ii) road pricing; and (iii) the banning or punitive charging of the most polluting vehicles to remove them from our streets. In CCAL’s view, the ERCC is being used to address (i) and (ii) and the Low Emission Zone (LEZ) is being used to address (iii). banning or punitive charging of the most polluting vehicles to remove them urgently from our streets but urges Mayor Livingstone to address all road users fairly and to discourage and ban the use of each category of the most polluting vehicles according to its overall contribution to the problem. CCAL therefore urges Mayor Livingstone to press ahead with the key pillars of the Emissions Related Congestion Charging Scheme but to take full advantage of the scope of the scheme to introduce further bold measures that will improve London’s air quality sufficiently quickly that it will meet its legal obligations. In researching our response to this consultation, CCAL has found the following significant information. 1. The European Commission announced on Wednesday 17 October 2007 that it is commencing action against the UK for breaching EU legal limits for the most deadly particulate matter (PM10). It looks from the announcement that the European Commission is sensibly developing this option in parallel with negotiations on the proposed new EU Air Quality Directive. You will be aware that CCAL is insisting upon “three red lines” in respect of the proposed EU Air Quality Directive to protect citizens from fudge, loopholes and inaction under the new regime. If those “red lines” are not met, CCAL has urged the rejection of the proposed Directive in its entirety, which would mean, inter alia, that no time extensions would be allowed (even with the currently proposed strict conditions) from meeting the UK’s current obligations on NO2 by January 2010. Question 1: By what date does Mayor Livingstone consider that the EU Legal Limits for each regulated air pollutant will be met sustainably throughout London? 2. TfL’s Low Emission Zone Consultation document nearly a year ago showed that over 700,000 Londoners were expected, without further action planned, to be exposed to unhealthy levels of NO2 in 2010. Question 2: What action is Mayor Livingstone taking currently to ensure that EU Limit Values for NO2 are achieved urgently and sustainably throughout London? To put the seriousness of this problem in perspective, particulate matter alone is estimated to have caused some 1,031 premature deaths in London in 2005 with some 1,600 premature deaths in total from air pollution in London. This compares with about 230 deaths from road traffic accidents in London in each of 2005 and 2006 and some 617 people nationally estimated to have died per annum from passive workplace-related smoking before the recent smoking legislation came into force. Road transport is cited regularly as the biggest single cause of air pollution in London’s busiest streets. Question 3: Why are the current LEZ and ERCC proposals not playing a much more ambitious role to reduce air pollution in London urgently? 4. Vehicle engines meeting the latest Euro 4 emissions standards (for NOX and PM) are almost half as polluting as those with Euro 3 emission standard engines and some six times less polluting than pre-Euro emission standard engines i.e. taking one old vehicle off the road is six times more important than taking one newer vehicle off the road. Question 4: What is the environmental and social justice in letting over 1,000 people a year die prematurely in London from air pollution when the oldest and most polluting vehicles are not even targeted specifically by the ERCC with the worst of them banned by the LEZ? 6. According to the London Atmospheric Emissions Inventory Report 2003, motorcycles are forecast to produce 19.0% of the deadly exhaust particulate matter (PM2.5) from all vehicles in the Central Zone by 2010 (compared to only 13.7% for all cars). Question 6: Why are motorcycles not being charged as part of the ERCC scheme proposals, with the worst of them banned under the LEZ, when they are amongst the biggest polluters? 7. According to the London Atmospheric Emissions Inventory Report 2003, cars are expected to produce 13.7% of the deadly exhaust particulate matter (PM2.5) and 14.4% of the NOx from all vehicles in the Central Zone by 2010 with diesel engined and older vehicles being by far the most polluting. CCAL supports Zero Charging for petrol engines for Bands A and B provided also that they meet at least Euro 4 emission standards (for NOx and PM) or better. CCAL supports Zero Charging for diesel engines for Band A provided also that they meet at least Euro 4 emission standards (for NOx and PM) or better. Question 7: Why not include in Zero Charging for diesel engines for Band B only if they meet Euro 5 emission standards (for NOx and PM)? 8. According to the London Atmospheric Emissions Inventory Report 2003, taxis are expected to produce 37.1% of the deadly exhaust particulate matter (PM2.5) and 24.6% of the NOx from all vehicles in the Central Zone by 2010 (compared to only 13.7% and 14.4% respectively for all cars). Question 8A: What plans does Mayor Livingstone have to follow on from the current Taxi Emissions Strategy which is due to finish in July 2008 by when taxis need to meet Euro 3 emission standards for NOx and PM? Question 8B: Why not extend the 20 pence per fare environmental levy so that licensed taxis could meet, say, Euro 4 emission standards by January 2010 and Euro 5 emission standards by 30 June 2012? 9. According to the London Atmospheric Emissions Inventory Report 2003 (see above), Buses and Coaches are expected to produce 25.5% of the NOx from all vehicles in the Central Zone by 2010 (compared to only 14.4% for all cars). Question 9: Why does the ERCC not allow a modest fleet discount from early 2008 for the Buses and Coaches that meet Euro IV or Euro V emission standards for NOx and PM and charge a substantial premium for pre-Euro 3 vehicles (i.e. those meeting LEZ requirements for PM but not NOx) and a modest premium for those meeting Euro 3 emission standards for NOx and PM? This approach would complement the LEZ. 10. According to the London Atmospheric Emissions Inventory Report 2003 (see above), Light Goods Vehicles (LGVs) are expected to produce 23.4% of the deadly exhaust particulate matter (PM2.5) from all vehicles in the Central Zone by 2010 (compared to only 13.7% for all cars). Question 10: Why does the ERCC not allow a modest fleet discount from early 2008 for LGVs that meet Euro IV or Euro V emission standards for NOx and PM and charge a substantial premium for pre-Euro 3 vehicles and a modest premium for Euro 3 vehicles? This approach would complement the LEZ. 11. According to the London Atmospheric Emissions Inventory 2003 (see above), Rigid, Heavy Goods Vehicles are expected to produce 20.1% of the NOx from all vehicles in the Central Zone by 2010 (compared to only 14.4% for all cars). Question 11: Why does the ERCC not allow a modest fleet discount from early 2008 for HGVs that meet Euro IV or Euro V emission standards for NOx and PM and charge a substantial premium for pre-Euro 3 vehicles and a modest premium for Euro 3 vehicles? This approach would complement the LEZ. Amazingly, a Written Answer by Minister of State Stephen Ladyman on 25 June 2007 shows diesel engines for passenger cars producing 16.9 times more particulate matter and over 83% more nitrogen oxides than the petrol equivalents (with 4.3 % less carbon dioxide). California is so worried about the health effects of particulate matter that it aims to reduce diesel emissions of particulate matter by 85% by 2020 (see press release below) whereas the UK is expecting diesel use to grow by about 50% between 2002 and 2020 (see page 183 of the AQEG report referred to above) with a 54% only reduction in particulate matter! Is the UK taking the public health risks of diesel engine emissions seriously? Question 12: Why do the ERCC proposals not target at all the biggest single cause (other than the number of vehicles) of air quality problems in London i.e. diesel use? CCAL shared with you recently, its views on the trade-offs between climate change and air quality and described “the London Principle” whereby a 10 to one ratio was recommended for accepting trade-offs between the two components of air pollution (and only where absolutely essential). This supports a substantial shift away from diesel engines to petrol engines in cities and vice versa outside cities where there are substantially fewer air quality problems. Please consider therefore charging Band F cars which have diesel engines (and their pre-Euro equivalents) substantially more as part of the ERCC scheme unless they have at least Euro 3 engines (NOx and PM) by 2008 and Euro 4 by, say, January 2010. 13. Question 13: What is TfL’s vision for the relative roles and contributions of Emissions Relating Charging, the LEZ and road pricing? 14. Question 14: Finally, why does the ERCC assume in its central case that it will have no impact on the choice of vehicles by drivers and therefore no consequential improvement in air quality or carbon dioxide emissions? This assumption seems unduly conservative. We appreciate that some of these may be tough questions but how can London expect to satisfy the European Commission that it is making reasonable efforts to meet its legal obligations in respect of air quality, which it may be required to do shortly, when much more significant measures are clearly needed for London to do so. “The Tipping Point” was a book written by Malcolm Gladwell and published in 2000. The book describes how little things can make a big difference and how the “Tipping Point” is that magic moment when ideas, trends and social behaviours cross a threshold, tip and spread like wildfire. Gladwell explained the fascinating social dynamics that cause rapid change. CCAL supports, in principle, the philosophy of Emissions Related Congestion Charging on the basis that, for a given type of vehicle, it is the “amount of fuel burnt” that determines the air pollution produced by a vehicle. In our view, the key benefit of the scheme is that it offers an opportunity if used fully to accelerate behavioural change and investment decision making by private and commercial road users in a way that is likely to deliver both climate change and air quality benefits in the short, medium and long term. CCAL therefore urges Mayor Livingstone and TfL to introduce a substantially larger than currently planned package of measures designed to “Encourage Green Choices” and “Discourage Black Choices”, with clear further steps for at least the next five years, that will create a Tipping Point of behaviour and investment decision making that will play a major role in helping London to meet its legal obligations for air quality. The most polluting vehicles must be banned from our streets urgently and Dynamic Road Pricing is on the way…. 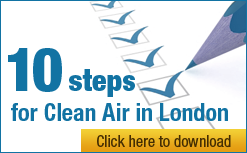 If this approach is not successful, CCAL considers that Mayor Livingstone and the Government will need to introduce legislation that will enforce the behavioural and commercial change necessary for London to meet its legal obligations for air quality. Technology or fuel-based (e.g. bio diesel) solutions are not enough; we are passing the last opportunity to influence and rely upon voluntary behavioural change after which the only remaining step will be restrictive legislation. CCAL urges Mayor Livingstone to build on his current, valued, support of its Campaign by committing further that London will meet at least World Health Organisation recommended standards of air quality sustainably throughout London by no later than the London 2012 Summer Olympics. Please take account of our questions and recommendations in respect of the ERCC and set out a clear five year plan now for meeting those obligations in order to allow sufficient time for private and commercial road users to modify their investment plans and take appropriate action with the minimum cost. Finally, thank you for taking seriously our concerns about air pollution in London and giving the issues we raise your particular attention. We recognise that you and others are already taking many steps that will improve air quality across Europe. We would welcome your considered response please to these questions by electronic reply to the email address provided separately.